Smitten and Spun – Blog » Prostiboots. Why ladies? Ladies, ladies, ladies. I’ve got something to get off my chest. I love me some shoes. Tis true, and I know there are other guys who appreciate a good heel, a nice wedge, a classic pair of black 4″ pumps, even some of those … Hey Spun what are they called? … oh yeah, ok, ballerina slippers or “flats”. They’re aok in my book under the right circumstances. Yet it seems as if you’ve been wanting to flirt with the end of the spectrum that, to be quite honest, isn’t all that becoming for upstanding, self respecting women. We’ll talk about the over the top, animal print on animal print atrocities, fUGGly furry boots, stripper heels not worn by strippers, and Belltown woohoo girls at another point, I’ve got a beef with you too; now, it’s prostiboots. Yup, I’m talking to you girls who have decided to mix it up with some bonus boot height to keep your knees warm and snuggly … or protected when searching for a lost contact lens. Spun and I saw tons of these in Spain. It was awful. We’d hoped that we were smarter or perhaps in this one instance the puritanical US would actually score us a win, but alas, no dice. For more on why these are awful and when you should wear over the knee boots, I give you a great manswer from Dr Awesome. Enjoy. First, let’s start with the thing I hate the most: huge tall boots that ascend from the ankle, usually stopping near the knees, sometimes continuing on past the shoulder blades and beyond. 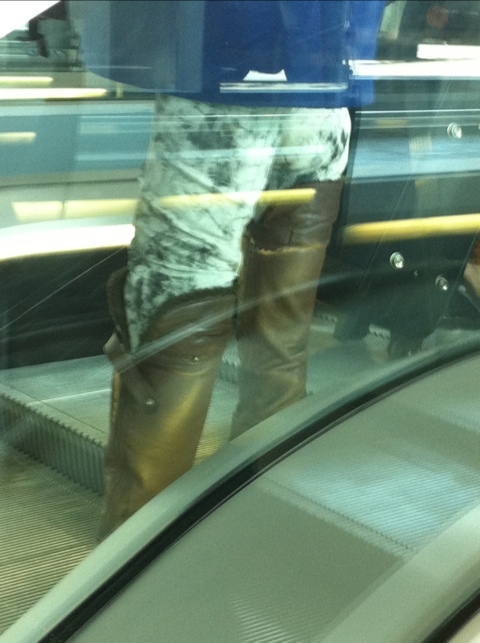 I hate these boots with a passion, because they serve no purpose other than to look like something prostitutes wear. Hence, I call them prostiboots. In my mind, there are only 2 reasons to wear big tall boots like that: when you are walking through high water, or when you are walking through an area prone to snake attacks. But most of these prostiboots are neither snake-proof nor water-tight, so they are just big wastes of leather. And I hate being wasteful. So you’ve got on these uneconomical, impractical prostiboots that will help you none when floods and/or water moccasins come to town, and on top of that, apparently you want people to think of you as a woman of the night. I just don’t understand this. Now I’m not saying all women who wear these jacked up knee prostiboots are in fact harlots of iniquity…I know lots of upstanding young ladies of fine character who wear these boots. I just want you all to know that I think these boots are prostibootish, and would prefer that you wore some more normal shoes that were neither wasteful nor inspired by Julia Roberts in Pretty Women. Eloquently stated sir. With that I give you other prostiboots caught in the wild. Oh and for the record, I spotted 5 on the way in this morning. Only one of which is documented (top photo). UPDATE — 5 unique prostiboots sightings on my walk to the bus tunnel. Most notably was this gem: ruffled, mid thigh. Wow. Offensive on many levels. Really blondie, no loitering in my market. Move it along. Newer: Happy Record Store Day! Georgetown RecordsOne of the many spoils of the day: No Shelter — Rage Against The Machine.